My name is Scott Drenkard, and I’m an economist and manager of state projects at the Tax Foundation. For those unfamiliar with us, we are a non-partisan, non-profit research organization that has monitored fiscal policy at the state and federal level since 1937. We have produced the Facts & Figures handbook since 1941, we calculate Tax Freedom Day each year, we produce the State Business Tax Climate Index, and we have a wealth of other data, rankings, and analysis at our website, www.TaxFoundation.org. I’m pleased to testify today on the fiscal year 2016-17 budget proposal as included in H.B. 64. While we take no position on legislation, I hope to share some of our research on these topics and insights from across the country. At the center of the Kasich budget is a proposal to further decrease all individual income tax brackets, bringing the top rate from the current 5.333 percent to 4.1 percent. I admire the stick-to-it-ness that the governor has displayed with regard to reducing the individual income tax rate over time. However, a costly error in recent proposals to reduce the income tax burden has been the inclusion of hefty deductions for pass-through businesses like LLCs, S-corps, and sole proprietors. In 2013, the deduction was set at 50 percent for income up to $250,000; then in 2014, the deduction was boosted to 75 percent of income, before reverting back to 50 percent at the start of this year. This year’s proposal doubles down on this approach, excluding 100 percent of pass-through income from taxation up to $2 million in gross receipts. The idea for excluding small businesses from tax liability is to promote job creation and growth in the state, but the unintended consequence of this policy is that it allows wage earners to change their structure to avoid paying any income taxes. For example, if they enacted this policy where I live in Washington, D.C., I would just go to my employer, the Tax Foundation, and ask them to start paying me as a contractor, then file my individual income taxes as a sole proprietor business and get a huge tax cut. I wouldn’t be contributing any more to economic growth—I’m still doing the same job—but state revenues would take a big hit. What’s worse, the Executive Budget estimates that this exclusion will be very costly—$337.8 million in fiscal year 2016 and $358.2 million in fiscal year 2017—for little additional growth. In Kansas, which started excluding 100 percent of pass-through business income in 2013, this carve-out has resulted in year-over-year revenue shortfalls, as more people shift their form to achieve tax-free status. The state had projected 191,000 people would receive this exclusion, but taxpayers started reacting to this new tax avoidance opportunity, and that number ended up being 333,000 people in 2013; for a total of $207 million in lost revenues. This is a bad deal. A much more straightforward approach would be to apply that revenue to across-the-board income tax cuts. Next, the budget proposal employs a lot of revenue offsets, and the ones selected are particularly economically damaging and non-transparent. The proposed hike in the Commercial Activity Tax (CAT) from 0.26 percent to 0.32 percent is the most harmful of these. The economic literature is not kind to gross receipts taxes. Criticisms go back as far as Adam Smith in 1776, and span across Spain, France, Italy; every country where gross receipts taxes were employed. Experts across the political spectrum have written about the pyramiding nature of gross receipts taxes, the non-transparency of the tax, and problems with taxing unprofitable businesses. 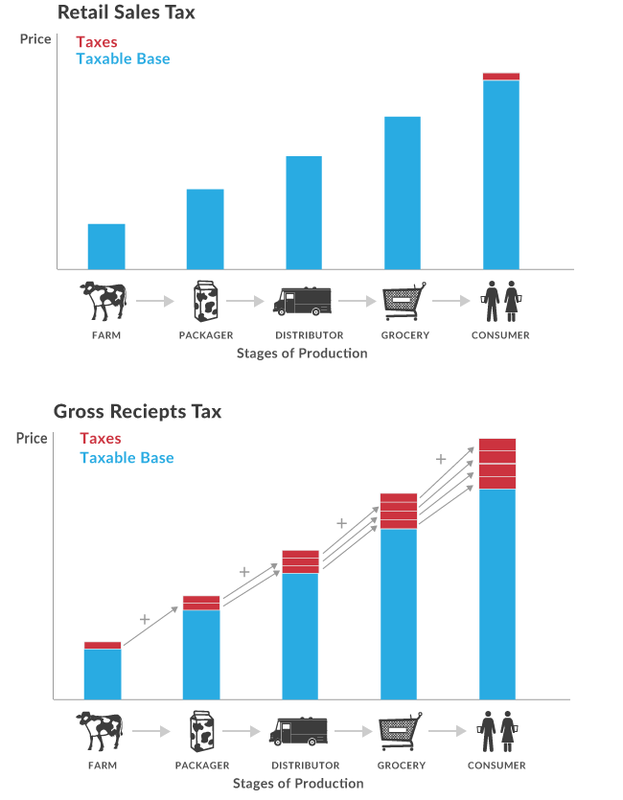 To illustrate the concept of tax pyramiding, I’ve included Figure 1 below, which shows how a gross receipts tax applies multiple times along the production chain, taxing a glass of milk at the farm, at the packager, at the distributor, and at the grocer. A sales tax, by contrast, applies just once at the final point of consumption. It’s important to remember that consumers of course still pay all of these pyramiding taxes, they just don’t see them because they are imbedded in the price of the product. The public finance problems caused by gross receipts taxes are responsible for their abandonment in almost every state. 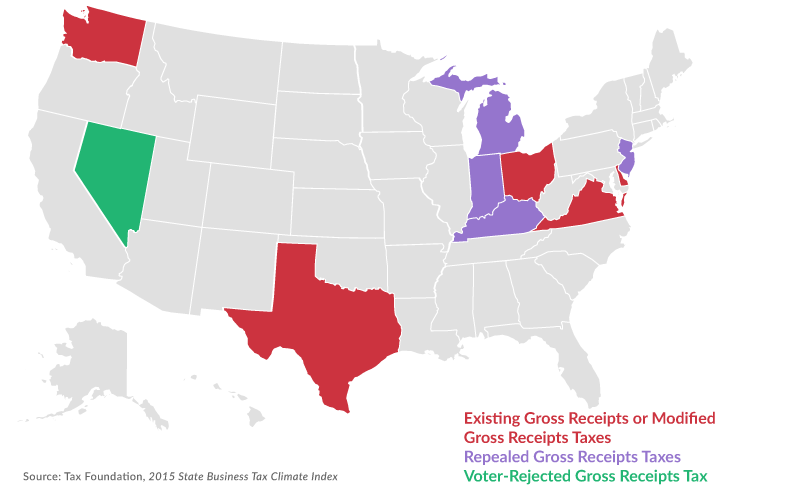 Today, just five states employ gross receipts taxes, and many have repealed them in recent years (Figure 2). States with recent repeals include Michigan (repealed 2011), Kentucky (enacted 2005, repealed 2006), New Jersey (repealed 2006), and Indiana (repealed 2002). Hiking the CAT rate would increase the state’s reliance on the most growth-damaging tax in the code, and should be avoided. Another part of the proposed budget that deserves scrutiny is the proposed hike in the cigarette tax from $1.25 to $2.25. 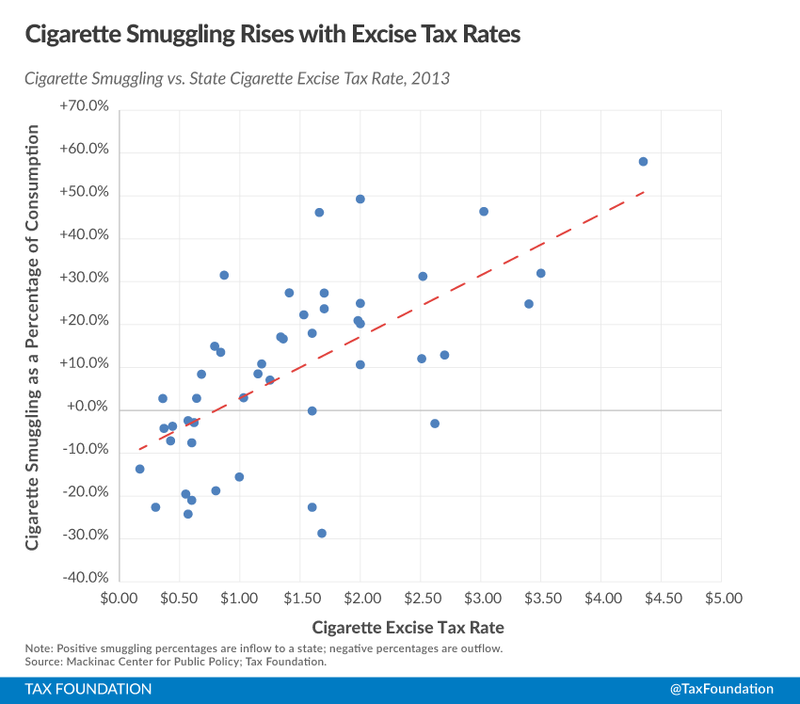 While the current state cigarette excise tax rate ranks near the median for the country (27th), the proposed rate would move the state to 11th nationally, opening the state up to cigarette smuggling, a problem that policymakers in high cigarette tax states know very well (Figure 3). Cigarette smuggling takes a variety of forms. 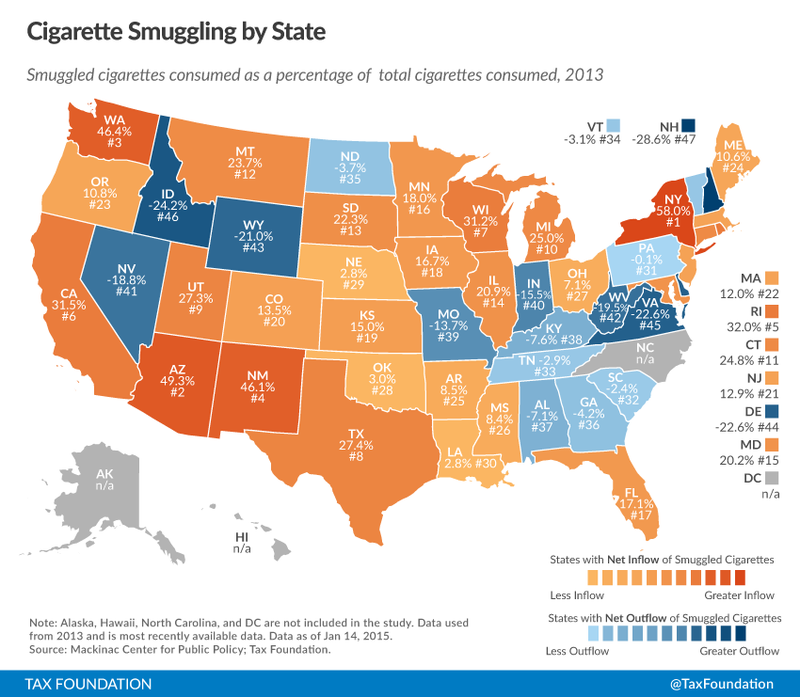 Sometimes it is the result of sophisticated crime rings that move large quantities of tobacco from low tax to high tax states, while other times it is more casual, with smokers themselves just stocking up on cigarettes when they happen to be in a low cigarette tax state and bringing those cigarettes home for personal consumption. In high-tax states, this problem is rampant. 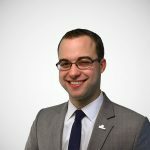 Dr. Todd Nesbit of the Ohio State University is the nation’s expert on cigarette smuggling, and his most recent estimates show that in New York, which has the highest state excise tax on cigarettes in the nation, 58 percent of the cigarette market is smuggled in from other locales (Figure 4). This problem is of course concerning for its implications for the rule of law in the state, but also because it means that long term budgeting based on tobacco revenues will be difficult. As smokers are likely to procure more cigarettes from across state lines, revenue numbers will take a hit. Alternatively, the increased cigarette taxes could “work,” and consumers could quit smoking, costing the state revenue. I’ve always found this last observation interesting, because tax hike proposals like this are counting on consumers to continue smoking, so the state can continue to fund public education, transportation, and public services on top of their behavior. In my opinion, if these programs are worth funding, they are worth funding with real, broad based taxes. Finally, the proposed budget would institute new taxes on electronic cigarettes at a rate equivalent to traditional incinerated cigarettes. The public health literature, however, does not support this approach, as electronic cigarettes are categorically less risky than traditional cigarettes. At least one recent study in Tobacco Control finds that e-cigarettes have potential as a tobacco-cessation method, because they curb nicotine cravings. My brother used electronic cigarettes to help quit, and I’m glad the option was available to him. I’d rather not see these innovative products get taxed out of existence. The budget as proposed has glaring problems that amount to a slew of tax changes without a central theme. While income tax cuts are warranted in this state, the small-business gimmick and revenue offsets in the CAT and on tobacco products would be highly damaging to the economy. Thank you for your time and consideration. Barbara Shelly, Picking Winners and Losers in the Great Kansas Tax Sweepstakes, Kansas City Star, February 26, 2015, http://www.kansascity.com/opinion/opn-columns-blogs/barbara-shelly/article11262932.html. Scott Drenkard, The Texas Margin Tax: A Failed Experiment, Tax Foundation Special Report No.226, Jan. 2015, https://taxfoundation.org/article/texas-margin-tax-failed-experiment. Scott Drenkard, The Texas Margin Tax: A Failed Experiment, ibid. Zachary Cahn & Michael Siegel, “Electronic Cigarettes as a Harm Reduction Strategy for Tobacco Control: A Step Forward or a Repeat of Past Mistakes?” Journal of Public Health Policy, 2011, Vol. 32, at 16-31. Christopher Bullen, et. al., “Effect of an Electronic Nicotine Delivery Device (E Cigarette) on Desire to Smoke and Withdrawal, User Preferences and Nicotine Delivery: Randomised Cross-Over Trial”, Tobacco Control, 2010, Vol. 19, at 98-103.